Two late great sax masters are featured in this podcast. Michael Brecker and Jackie McLean bookend this podcast. In between we explore the music of Mary Lou Williams and a young strong tenor player from Hartford CT, Jovan Alexandre. An African inspired podcast featuring some of the all-time great masters of jazz music. Harold Mabern kicks things off with his interpretation of Afro Blue with vocals from Gregory Porter. 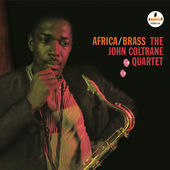 Than we get into the heavyweights with John Coltrane's Africa/Brass followed by McCoy Tyner and Jackie McLean. We start with honoring blues legend B.B. King who passed away this week. Next up are a couple of live tracks from Jimmy Greene and Jason Lindner. Our featured album is from Alexandre Silverio with the unique sound from the bassoon. We finish the podcast with a set of Fusion and rock classics performed by Jaco, Rez Abbasi and Rob Garcia. Some of my favorite Pat Metheny tracks to start this podcast. We feature two from 80/81. Then some straight ahead stuff from Hank Mobley and Johnny Griffin leading all-star ensembles. We finish with Greg Abate from his latest album Motif. Part two of the New Releases podcast kicks off with Lovano and Douglas's Soundprints, followed by drummer extraordinaire EJ Strickland. We then move to a more fusion sound from Marc Cary and Donny McCaslin. Next is a guitar set from Eubanks, Jordan and Lage. We finish the podcast with The Cookers Quintet from Toronto.